The weather on the morning of the walk was cool, windless and bright sunshine, a bit of a relief after the previous day’s rain and promise of more in the evening. Ten of us, including a visitor from the Natal Midlands, gathered at the Sunbird Centre where Greater Striped Swallows were flying into the entrance porch of the stone cottage, which dates back to 1904. Unfortunately there were no nests. 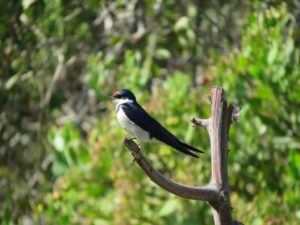 Southern Boubou, Hadeda, Egyptian Geese, Cape Weaver and a Pied Crow were seen around the buildings. A Cape Batis and Bar-throated Apalis were heard calling nearby but sightings eluded us. We started walking along the dirt road towards the section where the Silvermine River crosses the road and the path up the hill past the old vegetable fields starts. A Jackal Buzzard had been on the telephone pole along the tar road but was seen sitting on a bush close to the road. All around us Cape Grassbird, Cape Turtle Dove and Levaillant’s Cisticola were calling but not immediately visible. A pair of White-throated Swallows flew low past us as we made our way along the road and at the bridge we had close views as they sat on a dead branch, beaks full of insects, before swooping under the culvert where they have a nest. As we made our way up the hill good views were had of Cape Grassbird, Malachite and Southern Double-collared Sunbirds, Red-faced and Speckled Mousebirds, Neddicky and aerial displays of Rock Martin and Greater-striped Swallows. Unfortunately there were no Orange-breasted Sunbirds and only a brief view of a female Sugarbird was had. The vegetation has recovered well after the fires of 2015 and there are plenty of pincushions that were not burnt and are now in full bloom. At the old ruin we heard a Bar-throated Apalis but only Priscilla was lucky enough to see the bird. Back at the buildings, whilst we were having our tea, we were entertained by the Jackal Buzzard flying and hovering on the lookout for lunch. His mate was also flying nearby but it and another raptor were being bothered by the Pied Crow. The other raptor was a little bit too far away to identify for sure but could have been the Rufous-breasted Sparrowhawk that I had seen earlier that morning before leaving home. In all we saw 35 and heard 3 different species. Thank you to all who attended and hope that you enjoyed the morning as much as I did. Red-eyed Dove, Hadeda, Cape Weaver, Southern Boubou, Egyptian Goose, Greater Striped Swallow, Pied Crow, Bokmakierie, Jackal Buzzard, Cape Robin-chat, Yellow Bishop, Spotted Prinia, Cape Bulbul, White-throated Swallow, Brimstone Canary, Common Waxbill, Malachite Sunbird, Cape Sugarbird, Cape White-eye, Common Fiscal, Rock Martin, Cape Spurfowl, Cape Grassbird, Cape Turtledove, Neddicky, Speckled Mousebird, Red-faced Mousebird, Southern Double-collared Sunbird, Cape Canary, Fiscal Flycatcher, Red-winged Starling, Pin-tailed Whydah, Helmeted Guineafowl, Bar-throated Apalis, Olive Thrush. Heard: Cape Batis, Levaillant’s Cisticola and Sombre Greenbul.